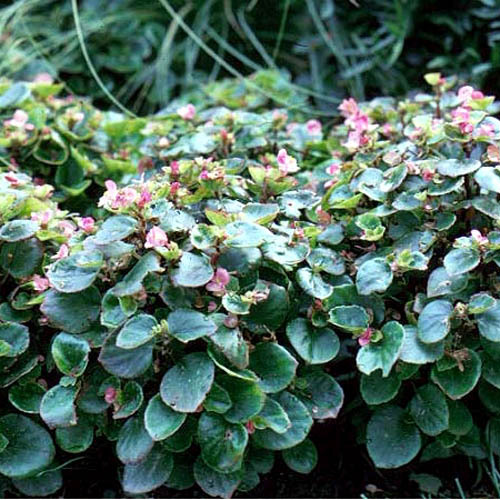 Prized for their shade-tolerance and attractive foliage and flowers, begonias are a timeless garden favorite. Some varieties have bronze-maroon leaves, but all are very sensitive to frost. Dislikes high temperatures so shield from direct sun in warm areas. indoors as a houseplant - Plants may be brought in from the garden in the fall if they are cut back severely to regrow indoors. Will often get spider mites indoors if air is too dry. Keep by sunny window and keep moist. Begonias have separate male and female flowers, which are borne on the same plant. Female flowers have a seed capsule below their petals, male flowers do not. Propagate by seed, cuttings, division or separation - Germination is difficult. It is easier to purchase plants or grow from cuttings. Start seeds indoors in January or February. Sprinkle on soil surface, and then cover with plastic or glass to keep moist. Do not cover seeds with soil. Double flowering cultivators do not come true from seed. Cuttings can be taken at any time. Division is best done in early spring from plants overwintered indoors. Pinch to keep plants bushy. 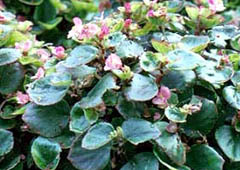 'Super Olympia' Series: early flowering plants with white, pink or red flowers and green leaves. Larger flowers than traditional begonias. 'Queen' Series: double flowering , green-leaved varieties with flowers in shades of pink, white and red. 'Coco' mix: glossy bronze/maroon foliage with showy flowers. Rounded and compact. 'Cocktail' Series: early flowering, dwarf 5-6� tall. Bronze/maroon foliage Flowers in shades of white, red or pink. 'Ambassador' Series: green foliage, flowers in shades of white, red or pink. Tend to stay more compact than other varieties. Early flowering. 'Varsity' Series: early flowering, large flowers in shades of red, white and pink. Green foliage. Especially good for container growing. 'Victory' Series: early flowering, large flowers in shades of red, white and pink.Green foliage. 'Paint Splash Pink': green foliage is mottled and dotted with cream colored spots and splashes. Flowers are pale pink and delicate looking. Showy and unique.